The Team at UVC uses the latest and greatest equipment available in veterinary diagnostic radiology. From taking complicated skull x-rays to evaluation of the lungs, heart and internal organs of animals - our equipment can do it all and do it in high resolution! 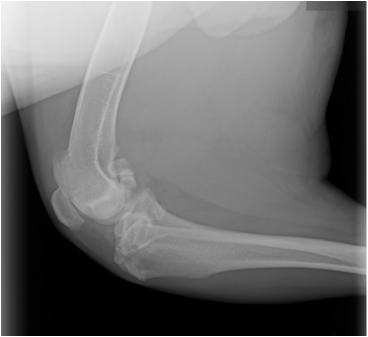 A 7 year old German Shepherd presented with lameness (limping) in his right forelimb. No obvious scratches or marks were seen. 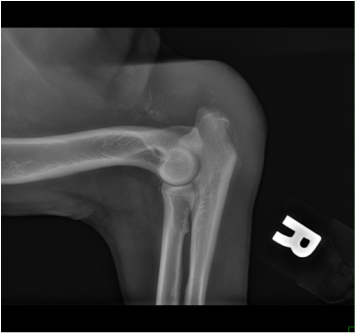 Digital radiographs revealed a comminuted olecranon fracture and the assumption was that the pet was hit by a car. Surgery was recommended. A 9 year old Terrier Mix was presented after being bitten by an off-leash large breed dog during a hike. Patient sustained severe trauma and x-rays helped plan for emergency surgery, which ultimately saved his life. 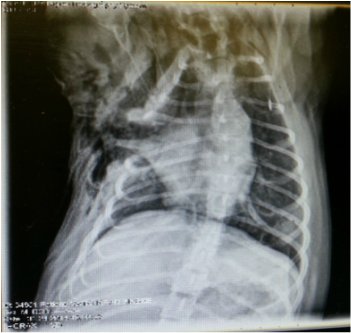 Without the x-rays, we wouldn't have been able to anticipate this level of damage before surgery. A 4 year old Pitbull was presented with acute limping and swelling in the back leg. Radiographic evaluation of the stifle (knee) joint revealed rupture of the cranial cruciate ligament. In humans, this would be the same thing as an "ACL tear". Our team recommended an advanced TPLO surgery to repair the torn ligament. X-rays of the pelvis and other structures that are typically fractured when patients are struck by cars in the street or freeway. ​The American College of Veterinary Radiology (ACVR). No exceptions.